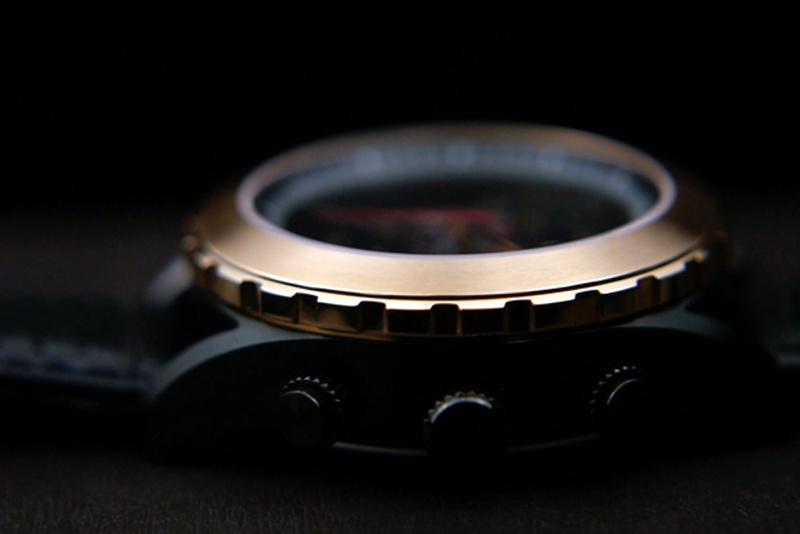 You’d never guess that the Superbe was a hybrid smartwatch. With its incredibly fashion-forward aesthetic, the Superbe is a gorgeous looking wristwatch with a unique dial and a simple yet classy design that’s fitting of its Parisian roots… but the Superbe is more than just a gorgeous looking wristwatch. It’s a hybrid smartwatch too, with a world-clock, activity tracker, sleep tracker, Bluetooth controls, and probably its biggest feature, its ability to work without needing to be charged. This eclectic combination of a great aesthetic, along with remarkable tech-features is what makes the Nowa Superbe the best of both worlds. At the heart of Superbe’s beautiful unisex design, is its square watch face. Ditching the straight lines, Superbe’s watch face is housed inside a bulbous square outline, giving it a bold character that looks great on male as well as female wrists. Backed with a Swiss Parts Quartz Ronda movement, the Superbe comes with a wide slew of smart features that sit under its innocuously mechanical exterior. The Superbe packs activity tracking, sleep tracking, a smart-trigger for your phone camera, Google Fit and Apple Health compatibility, a find-my-phone feature, automatic time zone adjustment, and by far my favorite feature… a battery life that can last as long as 2 years. The haute smartwatch that never needs charging, the Superbe is powered by a CR2025 battery that lasts 8 months in ‘Smart Mode’, and 2 years if used as a regular timepiece. The watch comes with 3ATM of water resistance too, allowing it to be worn at the gym or in the rain, just like any good wristwatch. At less than 10mm thick, the Superbe is thinner than most smartwatches too, and comes with a mineral glass with sapphire coating. The Superbe comes in 6 color variants, between black and white faces that sport matte and metallic accents. With a style that’s definitely a contemporary classic, the Superbe also comes with the ability to sport an Italian leather band, or a Milanese metal mesh band. Designed to reflect a Parisian sense of style on the outside, and cutting-edge technology on the inside, the Superbe is a watch meant for both the style-savvy and the tech-savvy… and the fact that it doesn’t need to be charged is just music to everyone’s ears! Click Here To Buy Now: $111 $214 (48% off). Hurry, Super Early Bird, only 83/200 left! Superbe is a thin hybrid smart watch with a sleek and clean design by Eric Gizard of NOWA. French Design meets Smart Technology, making it exquisite and exclusive. NOWA has been creating the thinnest hybrid watches since 2016. Superbe’s features include a world-clock, activity tracker, sleep tracker, Bluetooth controls, and probably its biggest highlight, its ability to work without needing to be charged. This eclectic combination of a great aesthetic, along with remarkable tech-features is what makes the Nowa Superbe the best of both worlds. The NOWA Watch App was recently released on the Google Play Store and will be available to download on the App Store before August. The Superbe comes in 6 color variants, between black and white faces that sport matte and metallic accents. With a style that’s definitely a contemporary classic, the Superbe also comes with the ability to sport an Italian leather band, or a Milanese metal mesh band. Superbe is smart and looks fantastic while being less than 10mm thick. Smart features: Push control. Classic crown style, Time zone analog watch: Time set by smartphone, Activity tracking (steps, distance, and calories burned), Sleep quality monitoring, Camera control for selfies, Call notifications through light indicator, Reject call with a push to the crown, Find your phone with a double push to the crown, Connects wirelessly to smartphone, One-week memory without having to sync, Connect to Apple Health and Google Fit, Battery life: up to 8 months in smartwatch mode. Timepiece features: Water resistance: 3 ATM, Case size: 36 mm (without the crown), Case thickness: 10 mm, Case material: 316L stainless steel, Movement: Swiss Parts Quartz Ronda, Glass material: Mineral with sapphire coating, Strap width: 18 mm, Strap material: Genuine Italian leather / stainless steel milanese mesh, Clasp material: Stainless steel, Light indicator, Interchangeable straps with quick release spring bars, CR2025 battery and Weight: 44 g (leather), 69 g (mesh). A lot of care and curation goes into the outfit you wear everyday. From your shirt, all the way to your shoes, everything is picked compliment one another in order to look great as a whole. The Dango Modular Watch takes on a similar approach. Split a watch into three key details, the face, the lugs, and the band, Dango’s watch comes with interchangeable parts, allowing you to easily build a watch the way you build an outfit…with care, consideration, and a sense of style. The Dango Watch’s dial comes in three different design variants. A minimal-yet-solid Trek variant for people who want a watch face that’s bold but not overdone; a more chunky, diver-friendly variant titled the Dive, that’s armed with luminescent dials and a water resistance of up to 200 ATM; and lastly, a variant for the serious wristwatch aficionado, the Chrono, with its three subdials, also including a stopwatch. The three visual styles broadly cater to three different personas (although it’s highly likely that you could like more than one, just like me), but boast of the same ability to switch up bands and lugs. They’re built to be inter-compatible (so that bands and lugs can be used between too), and you can even ditch the lug by attaching the band directly to the watch’s body. While visually different, the watches come with the same attention to detail and level of construction we’ve come to know and love with all of Dango’s EDC products. Each watch is powered by a Swiss Ronda Movement encased in a 316L stainless steel casing and viewed through a sapphire crystal. While a RONDA Cal. # 515-2 powers the Dive and the Trek, giving both variants a battery life of 45 months, the Chrono comes with a RONDA Cal. # 3540.D, packed with a larger battery that powers it for 54 months. 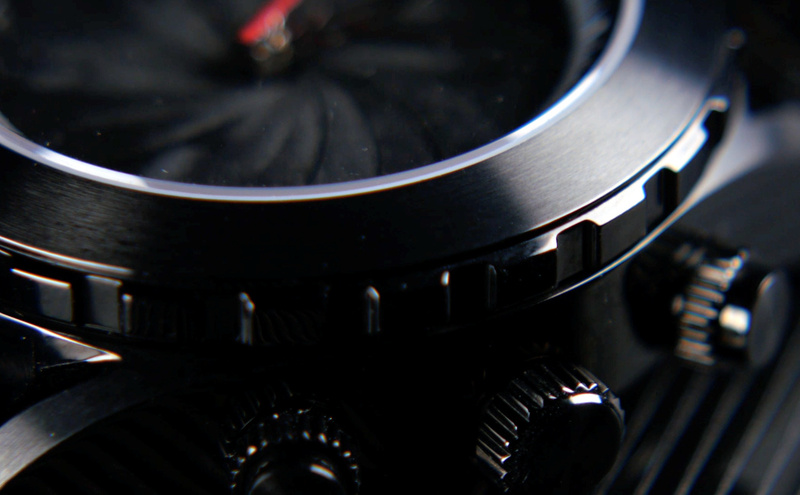 All three watch styles pack a date window too, for extra measure. 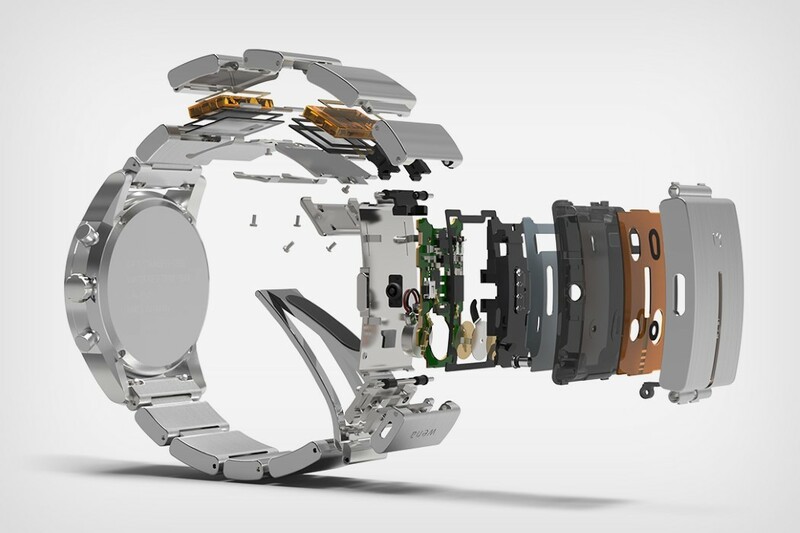 At the very heart of the Dango watch is its ability to be modular. 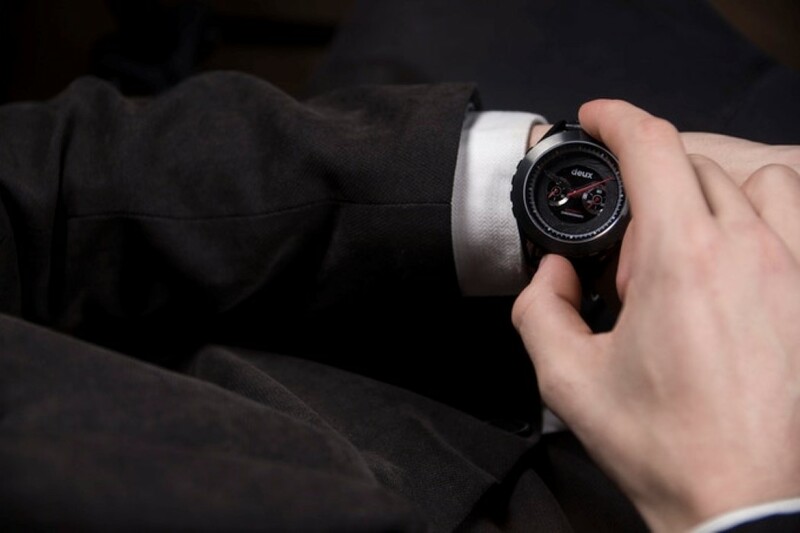 The interchangeable lugs and bands instantly allow the watch faces to take on different avatars, allowing some to go well with casual apparel, some to complement a leather jacket, and others to look great with a suit and a tie. With a choice between NATO, Stainless Steel, Silicone, and Horween leather straps, you can simply and easily change the way the watch looks on your wrist (even choosing to use or ditch the lugs to create unique styles), allowing it to be crafted with the care and diligence you’d take to choose your outfit… and it its strong, robust, long-lasting build, the Dango will see you through all your style-updates and changes through the years! Click Here To Buy Now: $125 $200 (40% off). Hurry, less than 24 hours left! Dango Modular Watches with Quick Release Lugs and Straps come with Swiss Movement, Fine Materials and Modular Components. 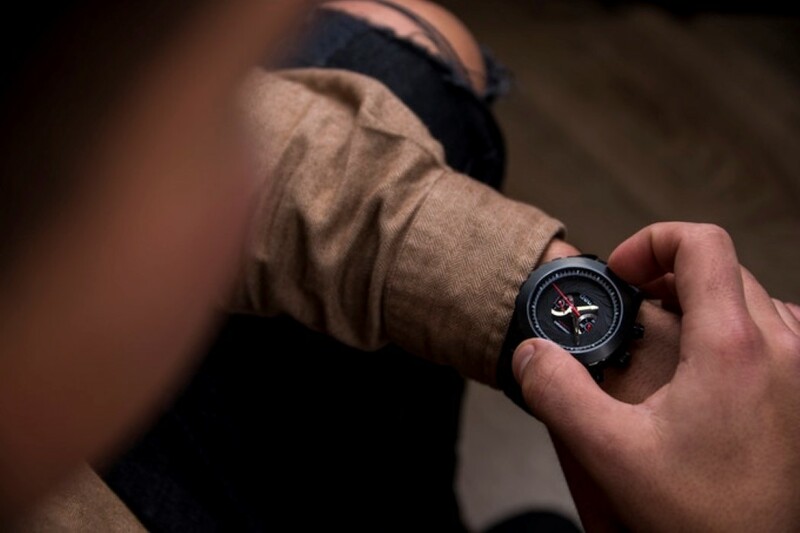 The line includes: the TREK – a field watch, DIVE – a sport watch that accompanies you on every adventure, and CHRONO – an automotive inspired chronograph watch. The TK-01 Trek, DV-01 Dive and CR-01 Chrono. Split a watch into three key details, the face, the lugs, and the band, Dango’s watch comes with interchangeable parts, allowing you to easily build a watch the way you build an outfit…with care, consideration, and a sense of style. The Design Story – The Dango Watch’s dial comes in three different design variants. A minimal-yet-solid Trek variant for people who want a watch face that’s bold but not overdone; a more chunky, diver-friendly variant titled the Dive, that’s armed with luminescent dials and a water resistance of up to 200 ATM; and lastly, a variant for the serious wristwatch aficionado, the Chrono, with its three subdials, also including a stopwatch. Each watch is powered by a Swiss Ronda Movement encased in a 316L stainless steel casing and viewed through a sapphire crystal. All of the watches come equipped with interchangeable lugs & quick release straps providing comfort, versatility and character. How to change the lugs. How to change the watch strap. Available Straps: Nato Strap, Ventilated Silicone Sport Band, Horween Leather Strap and Stainless Steel Bracelet with Micro Adjustment Buckle. Horween Leather offers an unparalleled blend of quality, consistency, responsiveness, and innovation. It is available on the TK-01 TREK Watch or the CR-01 Chronograph Watch. Click Here To Buy Now: $125 $200 (40% off). Hurry, Only 39 / 100 watches left! Click Here To Buy Now: $125 $200 (40% off). Hurry, Only 41 / 100 watches left! A future where you never have to charge your devices is closer than you’d think. Matrix’s PowerWatch 2 doesn’t come with a charging dock like most traditional smartwatches… that’s only because you, the wearer, are the charging dock! 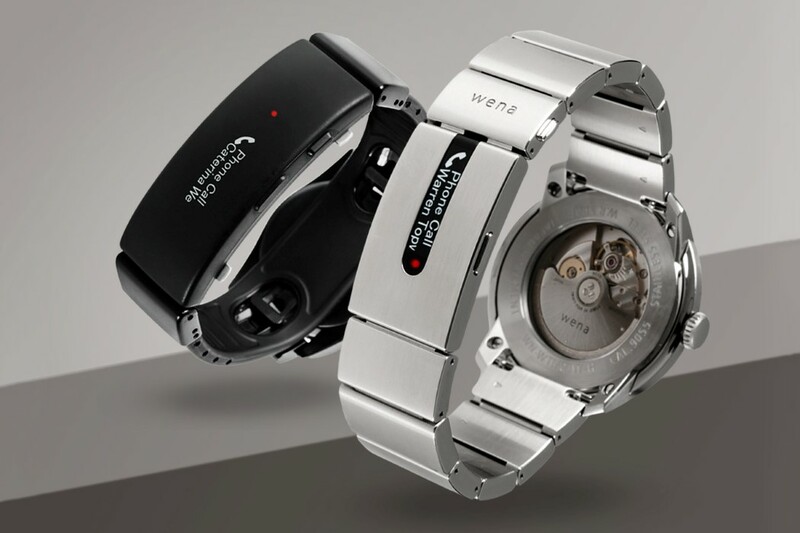 PowerWatch 2 relies on Matrix’s state-of-the-art thermoelectricity harvesting technology that captures body heat (a form of wasted energy) and uses that very heat to power the watch. Since every human’s body produces different amounts of heat based on genetic makeup, physical activeness, and location, the PowerWatch 2 packs a solar panel underneath its display too, allowing it to power itself entirely on energy that’s present around us, but isn’t tapped into. This literally means the PowerWatch doesn’t need a battery or a charger, and can run forever as long as it’s on your wrist. Debuted at CES this year, the company aims to showcase the potential of using body heat (a form of energy that’s usually lost) as a means to power consumer technology. However, while the technology is incredibly ground-breaking, it’s equally nascent… I mean, there’s only so much thermal energy a watch that’s sitting on your wrist can harvest, right? The PowerWatch doesn’t come choc-a-block with features, but rather models itself on a smartwatch/fitness-tracker hybrid. The watch comes with a color LCD display that displays a very Apple Watch-esque aggregation of data like the time, date, the number of steps you’ve walked, calories you’ve burnt, and even the amount of energy it’s harvested from you. It also comes with four button controls, packs an onboard GPS as well as active heart rate monitoring and basic sleep tracking, and is compatible with Apple HealthKit and Google Fit platforms. Oh, and the PowerWatch 2 is also water-resistant to 200 meters. Watches and cameras both showcase beauty in complexity. In fact, it’s no surprise that there’s usually an overlap when it comes to hobbyists who collect and refurbish old watches/clocks and cameras. The mechanical elements in both are incredibly intricate, and an art-form in themselves. 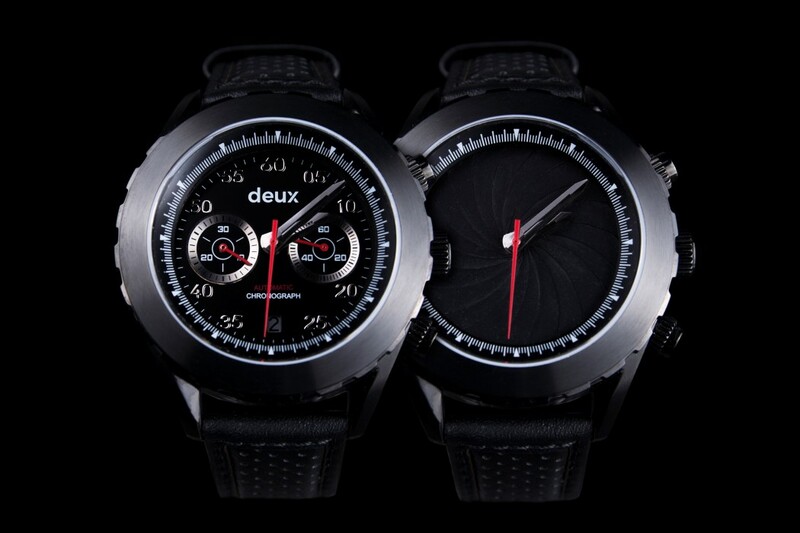 The Deux watch combines elements from both, creating a timepiece that is a remarkable blend of aesthetics, intricate detail, and by design, has two watch faces that you can swap between. 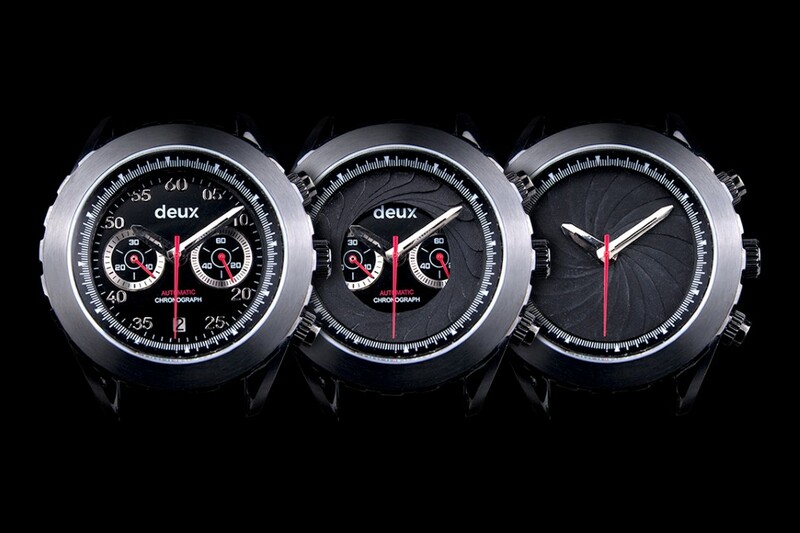 The Deux comes in three variants, sporting the same functionality, but with different movements on the inside. The Deux Chimera comes with an automatic Japanese-made Miyota 9122 movement, while its successor, the Janus is powered by the brand-new 34-jewel Seiko NE86 movement with a power reserve of 45 hours. The Janus Elite, the most premium of the three, packs a Swiss-made Sellita SW500 which allows the chronograph to sport three subdials as well as a date and day window. All three watches come with a 316L steel casing with a scratchproof Sapphire glass on both the front as well as the exhibition back, and boast of water resistance up to 5 ATM. 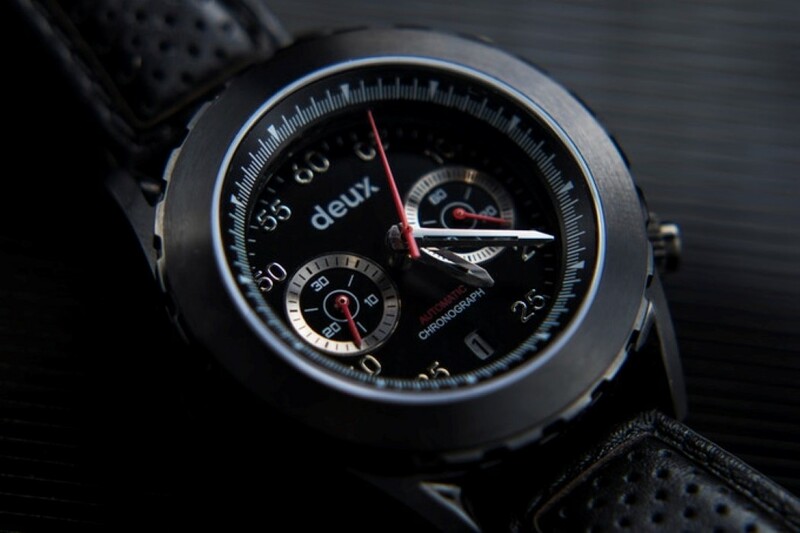 The Deux watches come with a choice between Italian leather straps and two metal strap variants; and sport three body colors (gold, silver, and metallic black) that complement the watch’s black face and aperture. 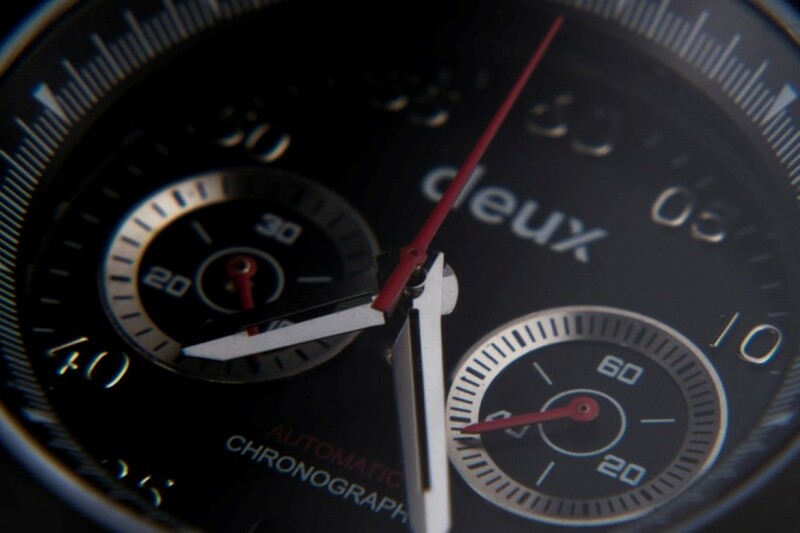 After all, the Deux is all about showcasing duality, making it a great watch for both minimalists as well as feature-lovers, and especially for people who love the beauty in mechanical intricacies. Click Here to Buy Now: $350 $500 (30% off) Hurry, only 13 hours left! When Apple first debuted the Watch, kicking off the wearable/smartwatch trend, people (including the Swiss) thought it would spell doom for the analog timepiece industry, but they couldn’t have been more wrong. What’s worth noting is that the smartwatch could never replace the finely crafted analog timepiece, because their target audiences were completely different. A person who marvels in and pioneers the finely-tuned, hand-crafted intricate analog timepiece would never want to replace that with a hunk of pixels. Sony’s Wena, however, allows those true-blue analog timepiece lovers to accept technology without surrendering their favorite timepieces. 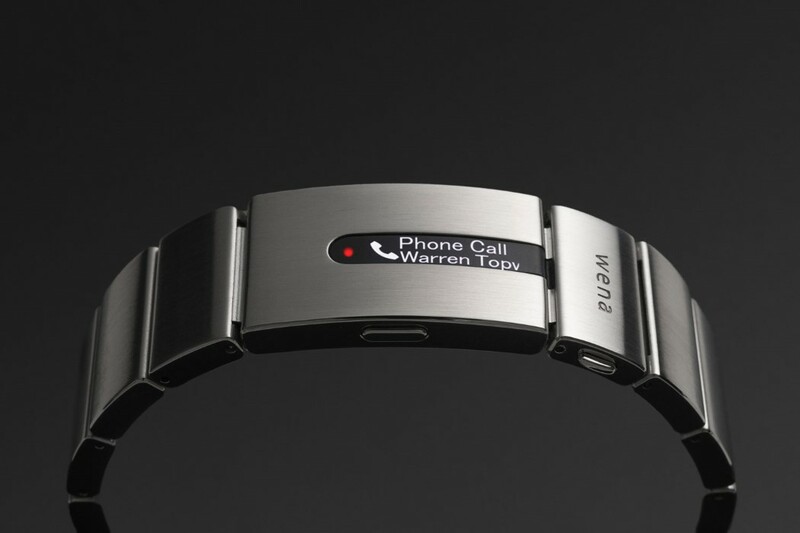 The Wena is a tech-filled band that can fit on any timepiece that sports an OLED screen of its own that can show you notifications straight from your smartphone. The beauty of the band is the fact that it doesn’t replace analog artistry with state-of-the-art tech, but allows them to coexist. 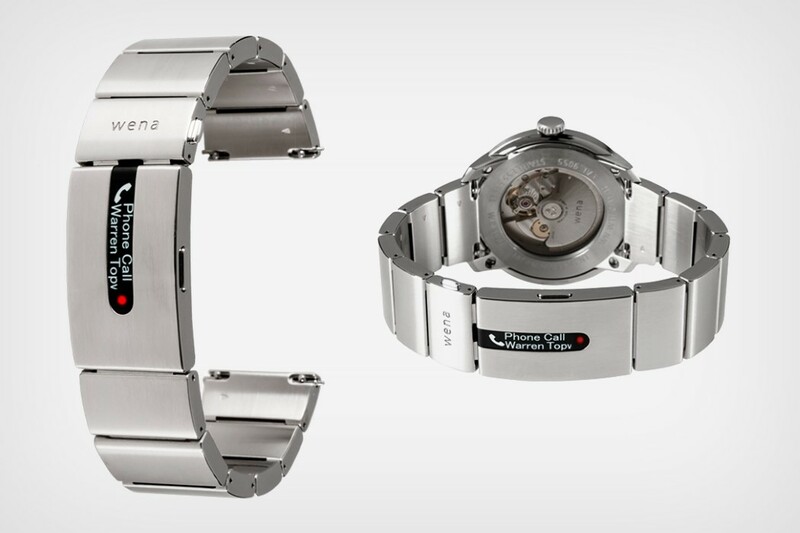 The Wena comes with a screen that pulls notifications from your smartphone, along with the ability to make contactless payments. The band can easily fit on any pre-existing analog watch you have, allowing you to hold onto your precious timepiece but still have the future and its perks right under your sleeve.